I’m back from my holiday in New England so the weekly newsletters will now re-commence. As per the picture right, the colours of the autumn leaves were spectacular! 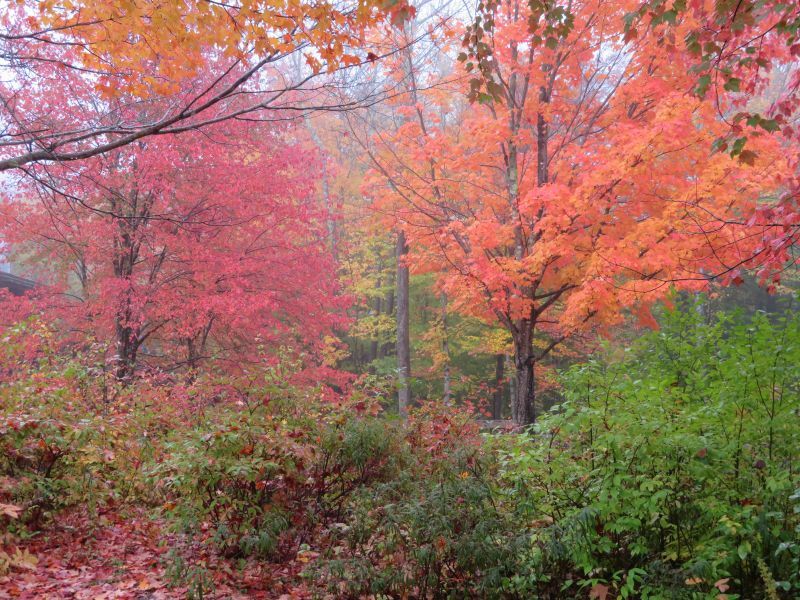 The maples were particularly vivid as their autumn leaves contain both carotenoids (which create the yellow colours) and anthocyanins (which create the red colours and thus, when mixed with the carotenoids, also the orange colours). Thanks to everyone who has contacted me asking if I enjoyed my holiday (I did) and the roughly equal number who have written in to complain about the lack of newsletters in October! 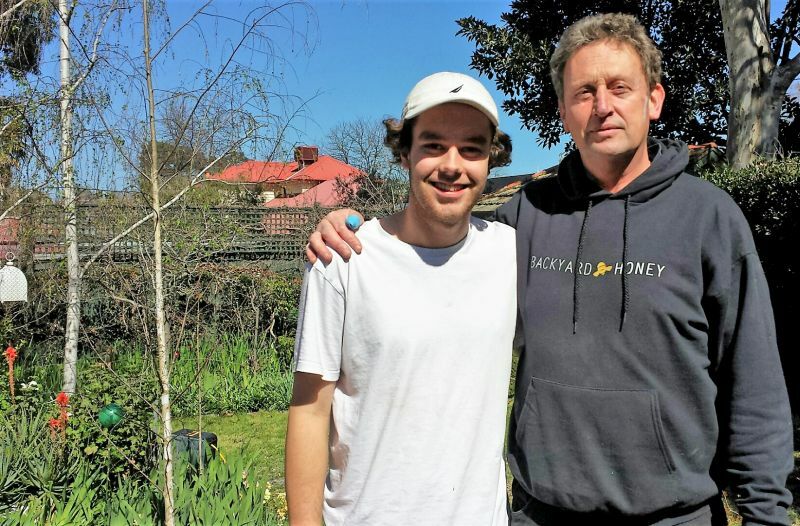 Judy Vizzari went to Surrey Hills to interview Peter from Backyard Honey at his suburban home. Their discussions ranged from the currently topical subject of ‘watered-down’ imported honey to why and how Peter and his wife Jane became apiarists. As Judy discovered, there’s a lot more to the business of beekeeping than you might think. “As well as supplying healthy honey bees, training their keepers, visiting the hives and collecting the honey, Peter and Jane visit schools, clubs and community organisations to raise awareness of the important role bees play in our lives. 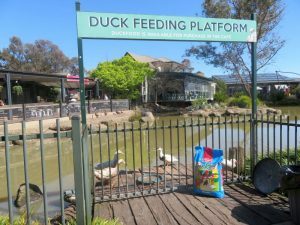 They also provide a swarm collection service and sell their honey and related products to many Melbourne outlets.” Read the full interview. If you have any suggestions for other people for Judy to interview, email us with their names. 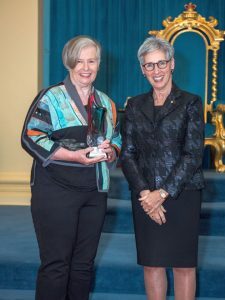 Robin was nominated for her leadership in the establishment of Sustainable Macleod, the Macleod Vegie Swap and the Macleod Organic Community Garden. The picture shows Robin receiving her award from Governor Linda Dessau. Read Robin’s citation on the Seniors Online Victoria website. Well done, Robin! This is the first of three mentions that Robin gets in this newsletter. The second mention, immediately below, is the monthly tip that she has written especially for us. And the third mention, later on, relates to her talk at the official opening of Macleod Organic Community Garden. What a hat trick! Passionfruit, like blueberries [which Robin wrote about last month], require quite acidic soil. They need a pH of around 5.5-6 so add granular sulphur, dig it in and then water in. Adding sulphur will also help release various trace elements like zinc and iron. 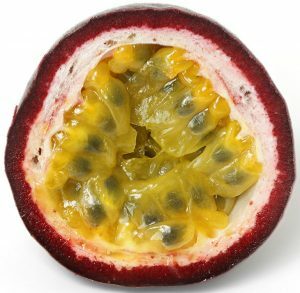 Passionfruit are heavy feeders of iron so you may need to add some iron chelate. In our climate, Nelly Kelly is the best variety. The tropical varieties are sensitive to frost and do not survive. Planting passionfruit in front of a north facing wall gives them the best chance of success. They thrive in full sun and need wind protection and strong supports to grow on, as the vine quickly becomes very heavy. Prepare the soil by incorporating compost and well-rotted manure in an area 2 metres’ wide. Let the tendrils grow to the top of your trellis and then nip out the growing tip which will allow laterals to develop. Passionfruit require around 140 litres of water a weekly when they are fruiting. This is the equivalent of around 15 fullsize watering cans. Without this amount of water, flowers and fruit will drop. For the past few years, Hurstbridge Farmgate has opened every Saturday morning during Spring and Summer to sell their homegrown vegetables, fruit and flowers. But this year, according to Hurstbridge Farmgate’s Facebook post of 8th October, they have been closed down by Nillumbik Council, who say that they haven’t got the right permit. Read, and potentially sign, a petition that asks Nillumbik Council to re-consider its position. Read – picture right – the front page of the Diamond Valley Leader of 24th October for their latest take on the situation. Cast your mind back a month, to when the last newsletter was sent out on 26th September. In that newsletter, Janet offered some free chook food to the first two people who asked for it. The first two respondents were Jo Douglas, Head Gardener at Montsalvat, and Karen Moad, Managing Director of Rivers of Yarrambat. After reflecting for a bit, we felt that it wasn’t right to exclude everyone who happened to wake up after 7am(!) and decided to offer chook food to two further people, chosen based on their responses. They are Eric Nuccio from Research and Celia McFarlane from Eltham Primary School. Congratulations to all four winners and commiserations to the rest of those who wrote in. 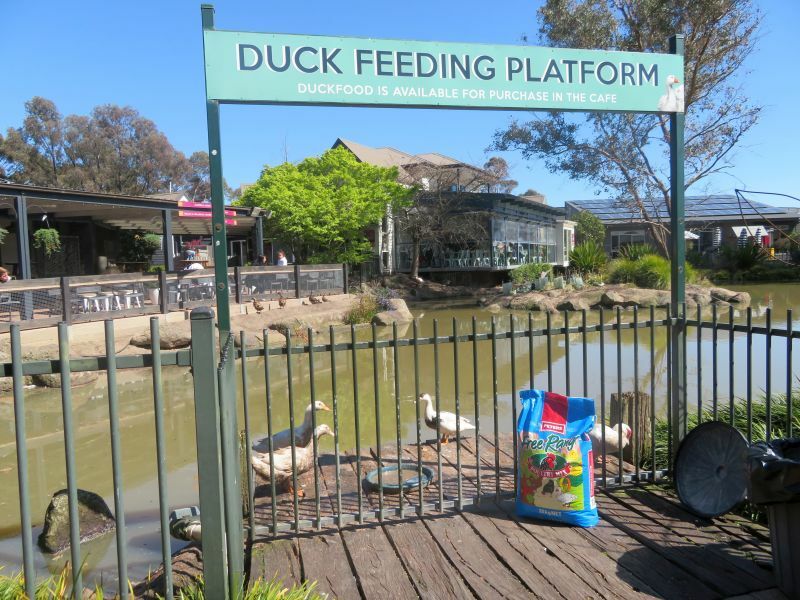 Here are some pictures of the winners’ chooks/ducks, in most cases at the time of receiving their free food. When I was at Monsalvat taking the picture above, Jo showed me the wicking bed in the chook shed. 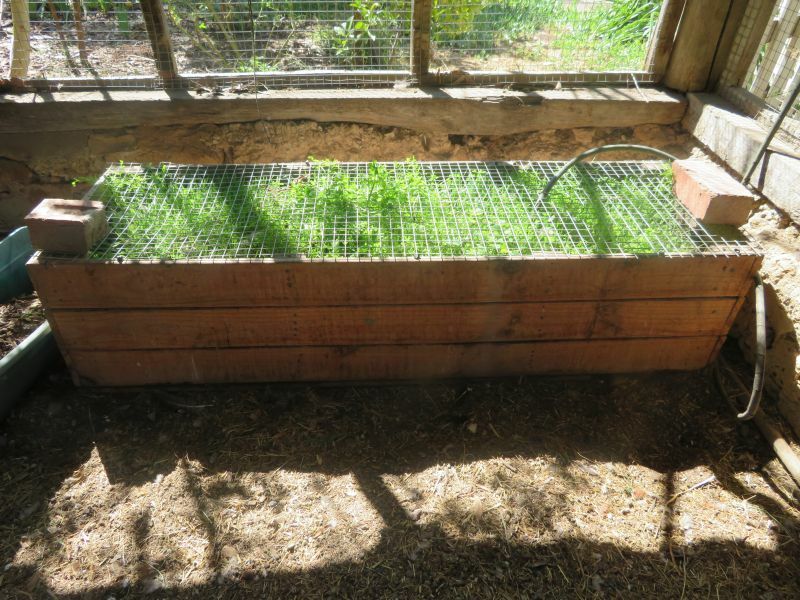 It has mesh on top such that the chickens can eat the greens down to the mesh but not below it. The greens have been chosen so that they are cut and come again. 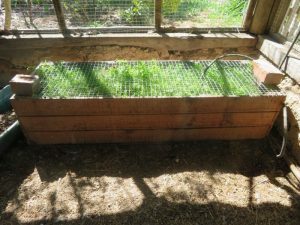 And the mesh is big enough to let chook poo through so the chickens fertilise the bed. A neat combination! In the last newsletter, I suggested that people buy the new book co-authored by Karen Sutherland and entitled Tomato: know, sow, grow, feast from an online book shop. Karen has now written in to say that I shouldn’t have done so: “I thought you’d like to know that Booktopia and similar online sites discount books so much that authors usually (us included) make a loss for every book sold there. We self-published, and so are trying to encourage people to buy from us directly [here is the relevant page from Karen’s online shop] or from a supplier such as Bulleen Art & Garden, CERES or Bee Sustainable. I had no idea until I wrote this book, and often bought from these sites.” My apologies, Karen, and thanks for the heads up. 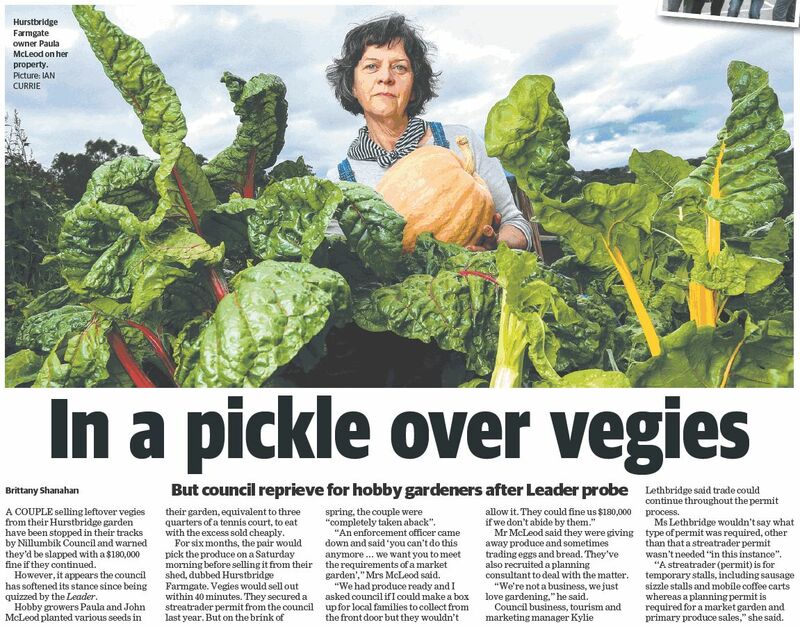 3000acres have teamed up with Open Gardens Victoria and the Lord Mayor’s Charitable Fund to open up productive backyards around Melbourne over the next year – big/small, owned/rented, in ground/in pots, etc. They are on the hunt for gardeners who might be interested in hosting ticketed tours or a workshop in their backyard with their support. If interested, email Morgan Koegel to chat about it further. Around 200 people turned up for the official opening of Macleod Organic Community Garden on 30th September. Speeches from Costa Georgiadis, as well as Robin and Paul Gale-Baker. Freshly made pizza. Garden tours. Lots of friends. Beautiful, sunny day. See Paul and Costa in the picture right. If you want to see more photos, view their ‘official’ photo album. Also, Watch Costa’s speech (37 minutes). Watsonia Library Community Garden is looking for volunteers to share tips and ideas and contribute to the maintenance of the garden. Go and garden, share the produce, chat and have a cuppa. Every Tuesday during school term, 10-11am. If interested, contact Lynne Siejka by phone (9435 2397) or email. Bellfield Community Garden is being threatened with closure as part of a draft Council plan to re-develop the area. The members of the garden are resisting the closure and have developed alternative proposals. Stacey Morland has written an article for the Transition 3081 Grapevine newsletter where she discusses the situation and makes suggestions about what you can do to influence the plan. Read Stacey’s article. Read the draft Council plan and comment on it. In passing, note that Bellfield Community Garden, like many of the other community gardens, has a regular program of social events. For example, in November, they are having a social/pizza night on Friday the 9th, their AGM on Wednesday the 14th and a working bee on Saturday the 17th. The Surrey Hills / Balwyn Produce Swap has moved to 230 Balwyn Road, Balwyn North, 3104. 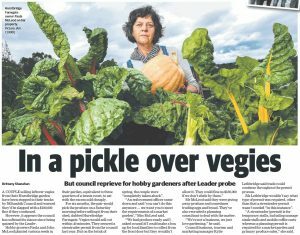 Of the 50 food-related proposed projects in North East Melbourne, 5 obtained enough votes to be approved. Leaf, Root & Fruit are hiring again, this time for casual gardeners/labourers. Work will be on a casual basis and will involve heavy lifting and manual labour. $22-30 per hour plus Super. Read more and apply. 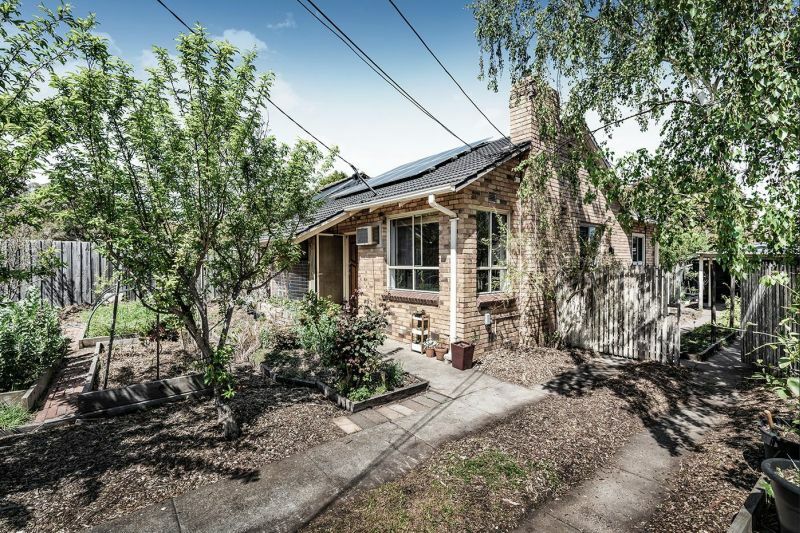 Newsletter reader Jonathan Warren, from Heidelberg Heights, is selling his house and he really would like it to go to someone who will maintain, and improve, the garden. The garden, which is focussed on food growing, is a major feature of the property and you can read about it on our website. Read the listing. You’ll have to be quick though – the closing date for expressions of interest is 6th November. Bruce Plain has written in to remind newsletter readers that VegeSafe, a program run by Environmental Science staff at Macquarie University, offer a very cheap ($20 donation) say of getting your soil tested for metal and metalloid contaminants. Read more. Submit sample. Any advice on growing broccoli? Anyone have any more advice for Stephen? If so, email me and I’ll pass it on. Compared with October, the list gets shorter, with some summer veggies dropping off (e.g. rockmelon, watermelon and zucchini) and with nothing added. Judy’s interview with Meg Montague. Toffee-nosed. Meaning: stuck up, supercilious or snobbish. First used in the early 20th Century. The ‘nosed’ part is an allusion to people who stick their noses in the air when faced with the hoi polloi. The ‘toffee’ part is nothing to do with the food but was derived from ‘toff’ (a slang term for well-dressed upper class men), which was in turn derived from ‘tuft’ (the tassel on academic caps worn at Oxford University by sons of peers). In passing, according to Wikipedia, the current English usage of hoi polloi’ “originated in the early 19th century, a time when it was generally accepted that one must be familiar with Greek and Latin in order to be considered well educated“. Amo, amas, amat, amamus, amatis, amant. Why do Communists only drink herbal tea? Because proper tea is theft. What: Book your kids a spot in the class and take home a delicious and healthy meal. Suitable for children aged 3-10 years. When: Three times on Saturday, 3rd November, at 11am, midday and 1pm. Bookings: by phone (9435 4000). Further information: LFC calendar entry. What: Farmer Em is a qualified teacher who is passionate about inspiring new young growers. BYO sturdy boots, gloves, water bottles, and old clothes that you are happy to get dirty. When: Saturday, 3rd November, 11am-midday. Where: Joe’s Market Garden, Coburg. What: Nuka zuke is a famous Japanese fermented pickling technique using rice bran. In this workshop, you will make your own Nuka medium/bedding so that you can keep pickling at home for years and years! When: Sunday, 4th November, 11am-1.30pm. What: CERES Nursery will be celebrating all things tomato with Karen Sutherland, from Edible Eden Design and co-author of a recent book entitled Tomato: know, sow, grow, feast. More specifically: growing tips, book signing and Q&A with Karen; this year’s favourites among the nursery’s 34 organic heirloom varieties with Farmer Meg; discounted tomato seedlings for sale, and signed copies of the Tomato book; and an option to follow it up with a tomato-focused Tamil Feasts dinner. When: Thursday, 8th November, 5.30-7pm. What: Enjoy 3 tasting size courses cooked by chef Bek McMillan, from Gourmet Living, who will demonstrate step by step. All recipes are included. Menu: coriander lime prawn salad; chilli sesame chicken; and christmas mousse tart. When: Friday, 9th November, 7-9pm. What: Artist Jamie Lewis will take groups on a tour of key Bonwick Street businesses, gathering food and stories before hosting conversations on place, community, food and ritual in one of the Bonwick Streets most vibrant laneways. When: This workshop will take place three times on Saturday 10th November, at 9.30am, 11am and 12.30pm. What: Sprawling outer suburban garden with many fruit trees, chicken system, enclosed veggie garden, and interesting examples of permaculture practice including water and energy systems. Large deck and outdoor kitchen with pizza oven. Tours on the hour, free tea/coffee/herbal or soft drink and a home-made treat, as well as a free plant or packet of seeds to take home. Children welcome but no dogs, please. Funds raised will support two causes – Headspace, which supports the mental health of young people, and Permaculture Australia, which works on behalf of permaculture people, enterprises and organisations all over Australia. When: The garden will be open on Saturday 10th November and Sunday 11th November, both 10am-4pm, with tours on the hour. What: Miso is a traditional Japanese seasoning produced by fermenting soybeans with salt and koji (the fungus Aspergillus oryzae). You will make your own high protein and enzyme rich miso paste following traditional Japanese methods. When: This workshop will take place three times, on Saturday 10th November, Sunday 18th November and Saturday 1st December, each 11am-1.30pm. What: The Watsonia Community Gardeners are continuing their tradition of giving away tomato seedlings (and other excess seedlings) for you to grow in your home garden. When: Tuesday, 13th November, 10am-1pm. What: Pack some herbs or flowers, your favourite recipe, some seedlings or seeds or cuttings and go to the end of year Good Earth swap. Helen will demonstrate the art of making a tussie mussie using some herbs and flowers from the garden. Meet other keen gardeners over a cup of tea. When: Tuesday, 13th November, 2-4pm. What: Gardening is an activity that fortifies the mind, body and spirit. A thoughtfully planned garden can be modified to accommodate people with an injury or disability, physical or mental. The goal is to have a garden that can be enjoyed by everyone, including the visually impaired or people in wheelchairs. When: Wednesday, 14th November, 11am-midday. What: Kombucha is a fermented drink that boosts your immune system, increases energy and aids digestion. Dean, from The Good Brew Company, will teach you how to create the perfect batch of kombucha using sustainable and simple techniques. When: Thursday, 15th November, 7-8pm. What: What can we do to before composting to help prevent food waste at home, how can we preserve commonly wasted fruit and vegetable scraps, and what are the other lesser known global initiatives happening around the world? Meet Jessie of Leftover Lovers as she shares her travel journey and kitchen practices with you. Participants will be invited to cook alongside each other as a way to open up discussion. All materials are provided and participants will leave with a jar of their own preserved goodies. What: Enjoy 3 tasting size courses cooked by chef Bek McMillan, from Gourmet Living, who will demonstrate step by step. All recipes are included. Menu: gluten-free pasta salad; honey citrus baked yarra valley ham; and Belgian milk chocolate mousse. When: Thursday, 15th November and again on Friday, 16th November, both 7-9pm. Further information: LFC calendar entry (Thursday, Friday). What: Shio koji is a Japanese fermented seasoning made with rice koji (cooked rice that has been inoculated with the fungus Aspergillus oryzae). When: Saturday, 17th November, 11am-1.30pm. What: In a 45 minute ‘parent-free zone’, children aged 6–12 years can learn from their chocolatiers how to make their very own chocolate creations. Includes personalised badge, chef’s hat and apron, graduation certificate plus take home three chocolate creations to enjoy. When: Saturday, 17th November, 9-9.45am. Where: Yarra Valley Chocolaterie, Yarra Glen. What: This class includes indulging in a range of chocolate & truffle tastings, the chance to learn about how chocolate is made, and finding out about the inspiration behind each of their specialty ranges with their European Chocolatiers. Your chocolate education concludes with the chance to create your own personal chocolate bar and delve in giant lollipop making fun. When: Saturday, 17th November, 12.45-1.45pm. What: Ben Moore, from Ben’s Bees, will share his love for bees, lifelong knowledge, practical skills, tips and tricks required to start and maintain your healthy bee colony in your garden. You will learn everything you need to know about urban bee husbandry to become a successful beekeeper. Specifically, you will learn: how to build and look after your hive seasonally; what equipment do you need and how you can use basic equipment from your household; where to keep your bees, positioning in the garden, flight-path direction; the importance of pollination and positive impact on your garden; the biology of bees – understanding cast system and swarm control to make sure you are looking after your bees successfully; identification and disease management of bees; environmental (e.g. weather, seasons) impact on colony health; how to set up a bee-friendly garden; and legal requirements. There will also be a demonstration on how to harvest bee products such as honey, pollen, bees wax, propolis (bee glue), together with an explanation of why bees produce these products and their uses and benefits for humans an bees. Participants will have an opportunity to see, smell, taste and feel all the products. The workshop will also include opening the hive, holding bees, tasting honey from the hive and much more. All the protective clothing will be supplied. When: Saturday, 17th November, 2-5pm. Where: Essence Workshops, Blackburn South. What: Suitable for beginners, and ideal for the backyarder, this two-day event is designed to provide participants with the information they need to start natural beekeeping with confidence. It will cover such subjects as: boxes, equipment, legislation, diseases, hive management, the role of the different types of bees, and how to use a smoker. After the course, for those that need it, the course organisers may be able to provide bees for your hive at no cost during swarming season. When: Saturday, 17th November and Sunday, 18th November, both 10am-5pm. Cost: $200 for members of Permaculture Victoria; $250 for non-members. What: The Cyprus Community of Melbourne and Victoria is organising its inaugural Halloumi Festival. Taste halloumi and watch it being made. When: Saturday 17th November and Sunday 18th November, both midday-9pm. Where: 495-511 Lygon Street, Brunswick East. What: Julie and Julia is the story of Julia Child, who brought cassoulet to a casserole culture in mid-20th century America, and Julie’s challenge to cook all the recipes in Childs’ first book. Rated PG. When: Monday, 19th November, 10.15am-12.30pm. What: Facilitated by Jen Jackson-Hall (Bellfield Community Garden Compost Coordinator) and Mikoto Araki (Permaculturist, active member of Transition 3081 and the Resource Utilisation Group of Murundaka Cohousing Community). Jen will show how she hot composts in her household backyard, with particular subjects including: compost thermometers; when to turn and when to leave the compost; and filtering for a finer processed compost. Mikoto will share her experiences of sustainable living and composting at Murundaka Cohousing Community, with particular subjects including: simple ways on how to reduce food waste; different composting systems (e.g. 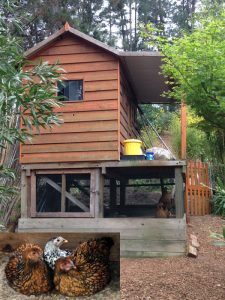 chicken systems, compost bins, worm farms and DIY bokashi buckets); and where to source carbon materials from. When: Saturday, 24th November, 10.30am-12.30pm. What: Interested in beginning with bees in your backyard but not sure how and where to begin? Join Bec, from Bec’s Beehive, in this introductory session covering hive set up requirements, legalities and seasonal expectations. When: Tuesday, 27th November, 7-8.30pm. What: What you will learn: how to prune to keep trees to a manageable size; how to prune to maximise fruit production in the coming season; and keeping espaliered shapes in check. Watch and ask questions of Angelo Eliades, as he prunes both traditionally shaped trees and espaliered varieties. Convention had us pruning deciduous fruit trees in winter but now the thinking is swinging to doing it straight after fruiting, in late summer or autumn. Techniques are slightly different, so it is wise to see the pruning in action on actual trees. When: Saturday, 1st December, 9.30am-12.30pm. Where: Bulleen Art and Garden. When: Saturday, 1st December, 10-10.45am. What: You will find out about the science of composting, learn some tips for recycling all your household food and organic waste into compost for your garden, and see a compost system in action. When: Saturday, 1st December, 10am-midday. Where: Glen Park Community Centre, Bayswater North. Bookings: by phone (9703 5288). What: Beeswax food wraps help keep food fresh and hygienic and are a perfect alternative to single-use plastic for covering bowls and packing in lunchboxes. At this workshop, you will learn how to make washable, reusable and compostable beeswax wraps. They will provide information on what goes into beeswax food wraps as well as how to use and care for them. Each participant will then be provided with an opportunity to make and take home three wraps. When: Saturday, 1st December, 2-4pm. What: What you will learn: basics of raw food; make guilt free treats; and learn what super foods are. What you will get: samples of all the food they make; and recipes to take home. You will discuss the nutritional benefits of superfoods, and how introducing more raw (natural plant-based) foods into your daily eating regimes can assist in your over-all health. Eating the right foods can help with reducing stress, anxiety and depressive states of being, increase your immunity and gut health and bring greater clarity into your lives. You will learn raw food cooking skills and get to feast on many different foods from savoury to sweet healthy treats (e.g. raw pad thai, raw stir fry, raw caramel slice, raw ice cream, raw lemon slice and raw cheesecake). No refined white processed sugars or products will be used. You will gain knowledge on the best natural sweeteners and produce to use to assist in optimal health. When: Saturday, 8th December, 10am-3pm. What: Keep your plants and harvest healthy and pest-free with these natural and environmentally friendly methods that are safe for you, your family, your pets, and your garden. When: Saturday, 8th December, 11.30am-1pm. Where: Kathleen Syme Library, Carlton. What: Irene Williams, from the Victorian Cake Decorating Society, will provide tips and tricks for decorating your Christmas cake. When: Monday, 10th December, 10.30-11.30am. What: Dot Evans, from the Cake Decorators Association of Victoria, will demonstrate how to make a gingerbread house for Christmas. When: Tuesday, 11th December, 10.30am-12.30pm. What: What you will learn: traditional Indigenous lifestyles and healing practices pre European settlement; traditional ways of using various Indigenous plants for medicinal purposes; and promising new research into their potential medical applications. What you will get: comprehensive course notes; and recipes and a chance to taste a number of Indigenous plant. Presented by Gaby Harris. Indigenous Australians have been using native plants and animals for tens of thousands of years as sources of food and medicine. With European settlement much of this knowledge was lost or ignored, but there is now growing interest in relearning these traditional healing methods. More research is being carried out to see how we can grow, harvest and utilise our Indigenous plants for foods, medicines, cosmetics and more. This class will introduce you to some of the well-known, as well as some more obscure, Indigenous Australian plants, teach you how they were once used, and how you can use them now. You will be able to see, smell and taste a variety of these amazing plants and learn where you can find them and how to cook with them. When: Saturday, 15th December, 9.30am-12.30pm. Plant-based midweek cooking class: Thursday, 1st November, 6.30-8.30pm. 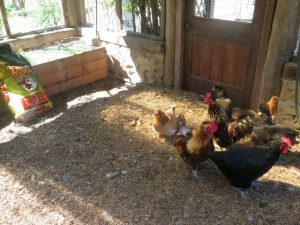 The joy of backyard chooks: Thursday, 1st November, 6.30-9pm. No Waste Cook Club Fitzroy: Saturday, 3rd November, 10am-midday. Kids cooking workshop with Dani Venn: Saturday, 3rd November, 11-11.40am. Farming for kids, with farmer Em: Saturday, 3rd November, 11am-midday. Kids cooking workshop with Dani Venn: Saturday, 3rd November, midday-12.40pm. Kids cooking workshop with Dani Venn: Saturday, 3rd November, 1-1.40pm. Nuka zuke – rice bran pickling: Sunday, 4th November, 11am-1.30pm.. Healthy lives plant-based cooking: Sunday, 4th November, midday-4pm. Talking tomatoes with Karen Sutherland: Thursday, 8th November, 5.30-7pm. Growing fruit and veggies in small spaces: Thursday, 8th November, 6.30-9pm. Festive inspired cooking master class: Friday, 9th November, 7-9pm. Eat drink talk shop: Saturday, 10th November, 9.30-10.30am. 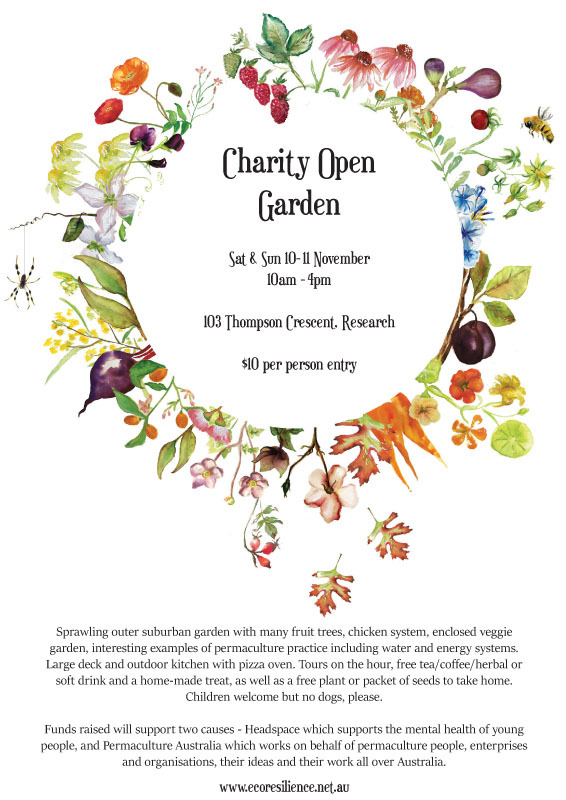 Charity open garden (Research): Saturday, 10th November, 10am-4pm. Eat drink talk shop: Saturday, 10th November, 11am-midday. Mexican – aguas frescas and kombucha: Saturday, 10th November, 11am-1pm. Miso paste making: Saturday 10th November, 11am-1.30pm. Green at Kathleen – preparing for summer harvest: Saturday, 10th November, 11.30am-1pm. Eat drink talk shop: Saturday, 10th November, 12.30-1.30pm. Introduction to permaculture (two sessions): Saturday, 10th November and Sunday, 11th November, both 10am-4pm. Arthurs Creek Mechanics Institute’s 30th annual garden walk: Sunday, 11th November, 9.30am-5pm. 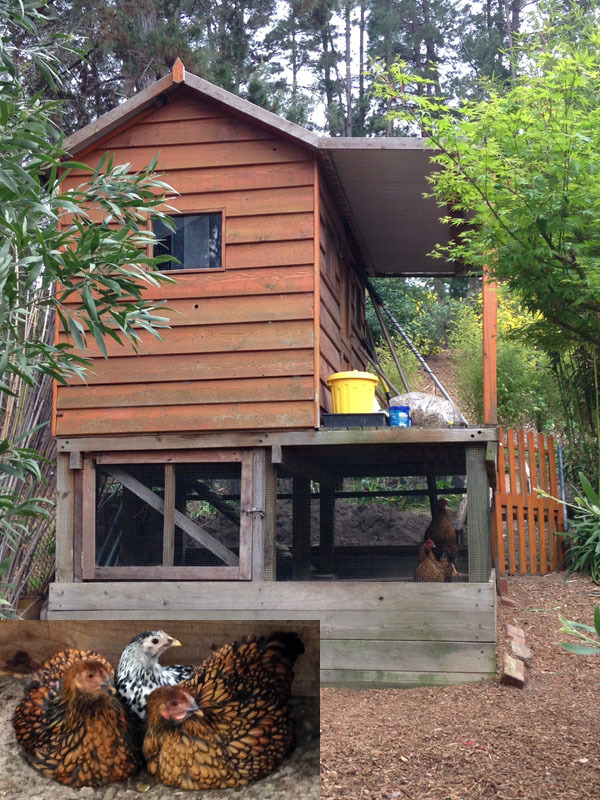 Open Gardens Victoria – chooks in the city workshop: Sunday, 11th November, 10-11.30am. Charity open garden (Research): Sunday, 11th November, 10am-4pm. 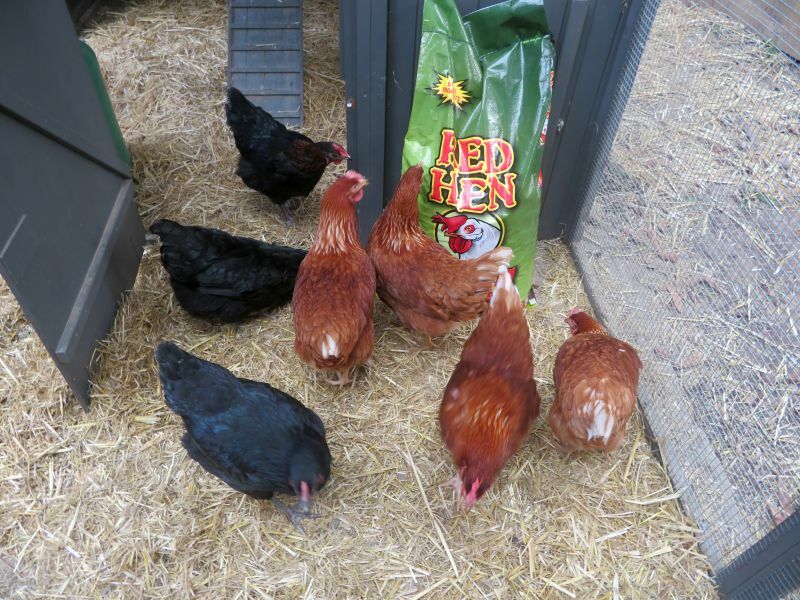 Open Gardens Victoria – chooks in the city workshop: Sunday, 11th November, 12.30-2pm. Great tomato giveaway: Tuesday, 13th November, 10am-1pm. Good Earth produce and plant swap: Tuesday, 13th November, 2-4pm. Raised garden beds are for everybody: Wednesday, 14th November, 11am-midday. Plant-based midweek cooking class: Thursday, 15th November, 6.30-8.30pm. Bush foods & herbs for courtyards & balconies: Thursday, 15th November, 6.30-9pm. Kombucha workshop: Thursday, 15th November, 7-8pm. War on food waste workshop and talk: Thursday, 15th November, 7-8pm. Festive inspired cooking master class: Thursday, 15th November, 7-9pm. Festive inspired cooking master class: Friday, 16th November, 7-9pm. Become a junior chocolatier: Saturday, 17th November, 9-9.45am. Shio koji making and cooking: Saturday, 17th November, 11am-1.30pm. Halloumi Festival Melbourne: Saturday 17th November, midday-9pm. Chocolate discovery class: Saturday, 17th November, 12.45-1.45pm. Beekeeping workshop with Ben: Saturday, 17th November, 2-5pm. Introduction to natural beekeeping (two-day): Saturday, 17th November and Sunday, 18th November, both 10am-5pm. Miso paste making: Sunday 18th November, 11am-1.30pm. Healthy lives plant-based cooking: Sunday, 18th November, midday-4pm. Halloumi Festival Melbourne: Sunday 18th November, midday-9pm. Julie and Julia (film): Monday, 19th November, 10.15am-12.30pm. Healthy productive compost and worms: Thursday, 22nd November, 6.30-9pm. No Waste Cook Club Carlton: Saturday, 24th November, 10am-midday. Home brewing with Paul Rigby: Saturday, 24th November, 10am-3pm. Bee hive tour: Saturday, 24th November, 10.30am-12.30pm. Spring backyard composting workshop: Saturday, 24th November, 10.30am-12.30pm. Backyard beekeeping workshop: Tuesday, 27th November, 7-8.30pm. Summer fruit tree maintenance: Saturday, 1st December, 9.30am-12.30pm. Become a junior chocolatier: Saturday, 1st December, 10-10.45am. Advanced composting workshop: Saturday, 1st December, 10am-midday. No Waste Cook Club Fitzroy: Saturday, 1st December, 10am-midday. Miso paste making: Saturday 1st December, 11am-1.30pm. Beeswax food wraps: Saturday, 1st December, 2-4pm. Healthy lives plant-based cooking: Sunday, 2nd December, midday-4pm.